The Free Multi Skype Launcher is a software app that allows users to open multiple skype accounts on a single computer. People all over the world use Skype as it is the most popular voice-over-IP software application that facilitates users to call people in different parts of the world at lower costs. With the ability to use multiple Skype accounts on the same computer, it is possible to communicate with different people at the same time. The Free Multi Skype Launcher allows users to sign into different Skype accounts and monitor all phone calls easily. This free app also allows users to add a few customization features to further simplify its usage. The Free Multi Skype Launcher includes a lengthy installation procedure. There are basically three programs which should be installed during the set up process. Once, the installation process is over, the free Launcher can be used to log into multiple Skype accounts simultaneously. It also allows the users to launch Skype within a fraction of a second of signing into Windows. It offers excellent and incomparable video chat programs. 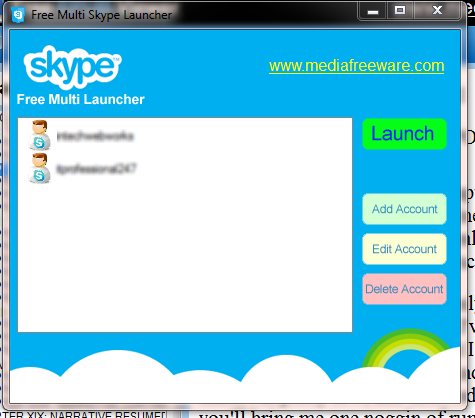 Users can utilize the Free Multi Skype Launcher to modify the accounts. New accounts can be added and old ones can be removed at will. Users can add several accounts by clicking the Add button. Accounts can be selected by clicking the Launch button. The Free Launcher will immediately connect to all the selected contacts or accounts. As the Free Multi Skype Launcher is a simple patch which modifies the features of an application, it seldom alters any Skype files. The Free Skype Launcher has simple features in the basic version and therefore it is quite easy to use. However, this free app also includes various advanced settings. It can also be uninstalled easily like any other software program.